Your actions always begin with your thoughts. As we could define mindset as “the set of your recurring thoughts about a topic”, then everything manifests from your mindset. If you think that you’re destined to be overweight, then it doesn’t matter how many diet books you buy or how many nutritionists you talk to, you’re still going to be overweight. Here your mindset is creating your overweight. 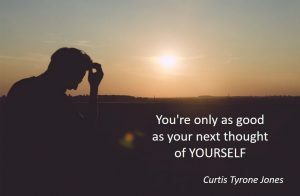 Overcoming negative self-talk requires you change your thoughts first. Thinking that you can’t counteract your overweight is a disempowering thought. To regain power, you must take responsibility Say to yourself, ‘I am the one who decides what I eat and how much I eat. I am the one who decides how much exercise. So I have the power to control my weight’. This will change the story you’re telling yourself and alters your mind from complaining to choice. This is how changing negative self-talk will turn the story of a victim into a story of strength. So your mental soundtrack can be changed. And you are the one in charge of doing it. A negative thought doesn’t mean you are a terrible guy or you have to listen to it. How to remove negative thinking? It’s not only a matter of mindset. It’s also a matter of focus. 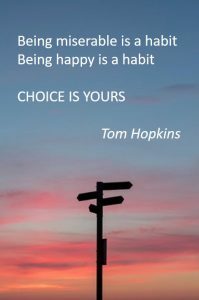 You can change your focus and instead of concentrating on the terrible day you had, you can start thinking about something good you are going to have today. A simple pleasure (a nice dinner? ), a warm relationship (with your partner? With your sons?). The fastest way to change your focus is by asking yourself a question. “What is good in my life right now? What little thing is ok? What is going to be ok?” and so on. Overcoming negative self-talk becomes easy when you acquire the habit of focusing on the positive with positive questions. Sometimes this requires becoming more aware of your intimate and repeated thoughts. 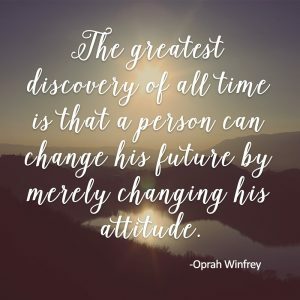 Give a look at this post at cornercanioncounseling.com to see 8 different types of negative thoughts that will sabotage your action. A popular computer concept is GIGO, which stands for “Garbage In, Garbage Out”. This means that if you give a computer nonsense input data, it will give you nonsense output data. This is true for your mind also. If we are surrounded all day by negativity (newspapers, magazines, TV, neighbors), how can we expect to output positive thoughts? 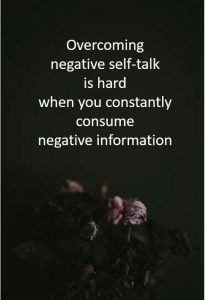 Overcoming negative self-talk is hard when you constantly consume negative information. If you really want to change your negative thinking, then your mind has to ingest good stuff. You want to read, listen to and watch information that lifts you up. These are positive self-talk activities that will make you feel better and more optimistic. 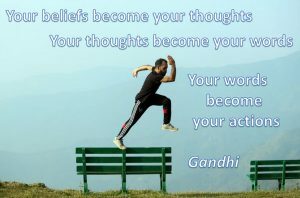 What you say about yourself becomes what you believe. So practicing positive affirmations every day can be a very healthy practice for your mind. Look in the mirror and tell yourself, ‘Today, I choose to be happy’ or ‘Today, I choose to fully accept myself’. When you speak these thoughts aloud, they’ll affect first how you talk to yourself, then how you live your life. Everyone struggles with negative self-talk at some point in their life. The important thing is not to punish yourself when you realize your thoughts are negative. Accept instead that you had a negative thought and deal with it in one of the empowering ways we’ve just seen. 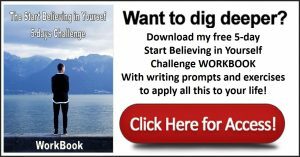 Overcoming negative self-talk is easy when you download the free workbook and do your positive self-talk exercises. Take action right now and learn to believe in yourself. 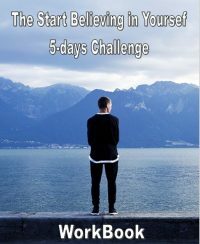 Engage in the 30 Days Self-Confidence Challenge! 6 Engage in the 30 Days Self-Confidence Challenge! Next Next post: Can’t Live Life Big Because of Your Environment?